I would challenge this interpretation of the comScore report. What the report is saying is that *web-based* email usage is declining, but that it is being offset by growth in *mobile* email usage. Overall usage of email is still high; the change is in the way that consumers access email. With two kids between the ages of 22 and 26, I don't doubt this at all. They no longer use email. if kids don't use Email these days, what do they use? I'm not surprised. It has become easier to contact your friends and family through Facebook than through email. The only use for traditional email which remains, is sending a resume. Why worry -or even comment- on this, Alan? Do Tweets, Facebook and other "social media" constitute information sources? "I'm not surprised. It has become easier to contact your friends and family through Facebook than through email." Maybe, but how easily can you find a comment (such as a job suggestion, etc.) someone made three days ago, or weeks ago, on Facebook? I can easily search my e-mail for information by author, subject, keyword, etc.-- without wading through irrelevant "updates" about what a person is having for breakfast, or endless photos of peoples' kids. I find the "signal-to-noise" ratio much too low on Facebook. I'll take e-mail over it any day. I agree with David B. The signal to noise is far too low and Facebook search is far to inconsistent with the results assuming you wanted to find something over a specific time frame. 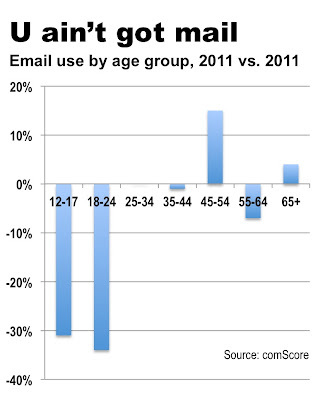 The reason a the 12-34 population do not use email is because they consider it a Formal means of communication just as we (44 - 70+) consider Snail Mail our formal means of communication. In comparison, students sometimes don't even read university-sent emails. If you want to reach them, you can try to call their cells. But for certain, they always read a text. So, if there is an important change in university scheduling or a weather or security announcement, we always use texts. Emails and the university website are where students go for more information. Cheers. I would cautiously posit that e-mail is shifting/receding to being a business function, both internally and B2B. People under the age of 24 don't fit that bill, except for those 21-24, and a lot of them can't find a job these days anyways. Will e-mail use narrow to a more formal atmosphere? Sure. But there are a tremendous number of types of information for which e-mail is the most useful, secure, traceable and verifiable (at the moment) source, especially for business and legal contexts. "The mobile email audience for both age segments saw double-digit growth in the past year, with mobile email users age 18-24 climbing 32 percent." About par for the course this is. E-mail for the most part, I believe, is confined to the busines world since a good chunk of businesses don't allow FB/Twitter usage. Texting is a different animal all together as at my job (a government agency) it is the primary means of e-communication, with e-mail being a very distant second. On a personal level, my two kids (11 & 19) do not e-mail. They text. I quite agree on this. 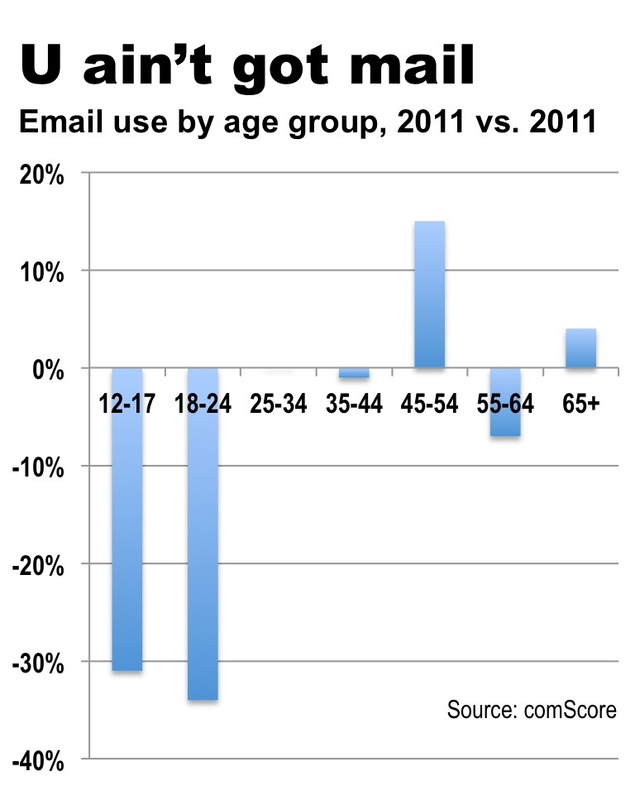 Out of our four kids the youngest three aged 16-21 don't use Email much. The oldest, now 26 uses Email at work. As for myself it's still the primary tool, but I use Twitter more and more replacing SMF and Facebook and Google+ for private messages (not Email). I don't see email going away totally, it will evolve into a different environment such as mobile websites or on Facebook which is already happening.